Long time, no write. I’m resurrecting the Healthraiser blog! Have you been wondering whether the results of the Beachbody Ultimate Reset are sustainable? Do you gain back all of the weight immediately? Do you have to forever banish alcohol, sugar, and fat from your diet? Do you become a crazy vegan hippie after the Reset ends? 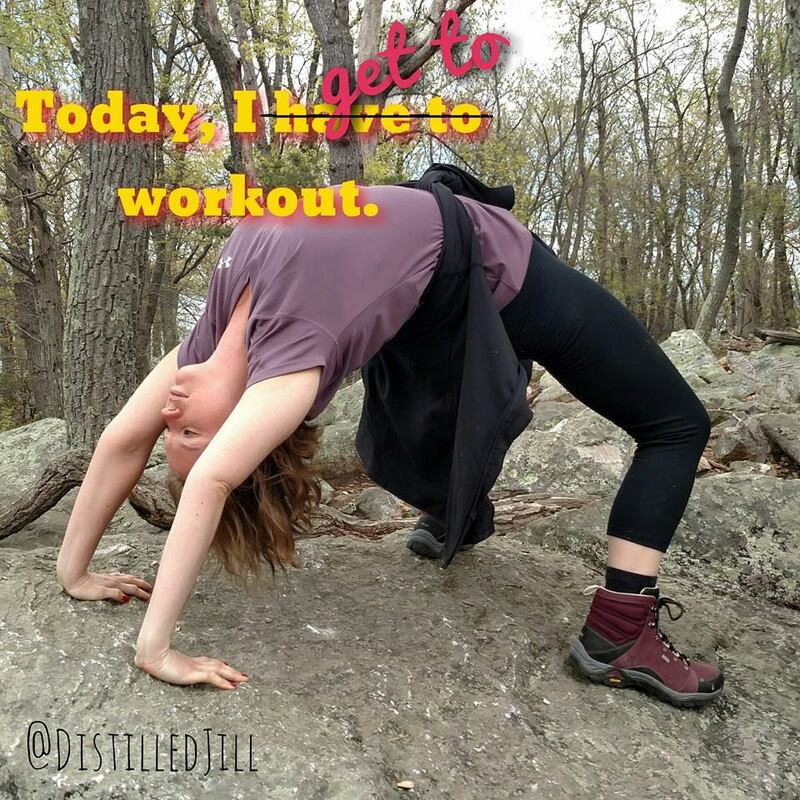 What comes next for Distilled Jill in her health and fitness journey? This entry will answer those questions. First off, I’m proud to say that 4 months after the Reset has ended, I have not only sustained the 8 pounds of weight loss from the Reset, but I’ve even lost about 5 more pounds. How? Continuing to eat healthy, incorporating some lessons that I’ve learned from the Reset into my daily routine in a way that achieves balance without depriving myself, and focusing on fitness. I’m a city girl. I love going out, trying new restaurants, bars, and festivals. My life post-Reset has made me realize that I can actually still be a foodie as long as I do so in moderation, while balancing other important aspects of health and fitness. The Reset really made me realize how much animal protein I was consuming. Honestly, I think the amount of animal protein that I was consuming was really holding me back in reaching my health and fitness goals. Since the Reset ended, I’ve decided to eat a vegan diet Mondays through Thursdays, with “anything goes” on Fridays, Saturdays, and Sundays. While “anything goes” generally means that I allow myself to eat red meat and dairy, I find that I don’t have that much even though I do not purposely deprive myself. I might have red meat once or twice a month now. I’m eating far less cheese. I think I might have had yogurt once or twice in the past 4 months. As a matter of fact, I find the smell of some dairy (e.g., yogurt, cheese) occasionally making me feel nauseous. When I do have a high-indulgence “anything goes” weekend, I’ve noticed sinus problems and bloating that always goes away during the vegan weekdays. I generally gain 3-4 pounds on weekends, but I generally lose 4-5 pounds during the week with a healthy diet and exercise. I’ve never had much of a sweet tooth, even before the Reset. So, my diet with regard to desserts hasn’t really changed. I’ll have refined sugar on occasion – normally for a special event. I try only to drink alcohol on weekends now. This has been working pretty well for me. While I have been in social situations with alcohol during the week (e.g., happy hours), I try to either limit myself to one drink or not drink at all. The Reset made me realize just how easy it is to refuse alcohol in a social situation. I’ve realized that if I’m going to drink, I don’t want to waste the calories on bad alcohol. I’d rather have a very nice craft cocktail, beer, or wine. I also don’t want to waste those calories on just one drink that doesn’t really hit me. If I’m going to drink, I’d rather have several drinks on the weekend where I can enjoy a good buzz. Anything else just seems like a waste of time and calories. I feel like I recover a lot faster from alcohol than I used to. I think that my organs are probably functioning at a much more optimized level than they did pre-Reset. A night of drinking generally isn’t taking me out of commission the following day. You cannot do any intense workouts during the Reset. Since I generally do a hard workout each morning, like Insanity, 21 days of not working out was difficult for me. Since the Reset ended, I have completed the Focus T25 program. I got my free t-shirt! Beachbody recently announced a new product called the 3-Day Refresh! This product is very exciting because it is essentially a mini Ultimate Reset! The 3DR consists of 3 daily shakes (including Shakeology and a new shake called Vanilla Fresh), a fiber drink (called Fiber Sweep), plenty of filtered (not distilled) water, plus a wide array of fresh fruits, vegetables, and healthy fats throughout the day to keep your energy and metabolism going. Unlike juice cleanses that are high in sugar and low in protein, the 3DR’s shakes provide plenty of protein and fiber to help ward of hunger pains and irritability. 1. Wake Up: Drink 8-12 ounces of filtered water to jumpstart your system. 2. Breakfast (within 1 hour of waking): Shakeology plus a fruit option. 3. Mid-Morning Fiber Sweep (digestive health drink). 4. Lunch: Vanilla Fresh (high-protein, hunger-satisfying shake) plus options from the fruit, vegetable, and healthy fats list. 5. Afternoon Snack: From the fruit, vegetable, or juice options list. 6. Dinner: Vanilla Fresh plus a delicious meal made from the dinner recipes list (the dinner recipes all look like they are from the Ultimate Reset recipe book). I plan to start the 3DR on Tuesday! In the past month, I had a decadent trip to Las Vegas, celebrated the nation’s birthday, AND my birthday, so I feel ready to try this cleanse. I’ll be taking a break from Insanity for this because you are only supposed to engage in mild to moderate exercise, and Insanity definitely is NOT that! I’ll post here like I did for the Ultimate Reset so I can share my journey with you. Wish me luck! As always, feel free to contact me by commenting below if you want more information on anything contained in this blog. 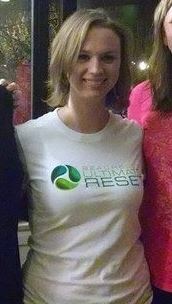 I completed the Beachbody Ultimate Reset 17 days ago. Today’s post is to provide an update on how my life is progressing post-Reset. My weight has been pretty constant since the Reset ended. I’ve been gaining and losing 1 pound. I’ve lost a little bit of fat, and gained a little bit of muscle. So, on average, I’m around where I ended on the last day of the Reset, which is great! One of the things that I missed during the Reset was my morning workout routine. During the Reset, you are not supposed to workout at all, with the exception of some light exercise like walking, yoga, and tai chi. Before the Reset, I did a variety of high-intensity exercise programs, like Insanity. During the Reset, I did yoga and Insanity recovery workouts – nothing too intense. When the Reset ends, there is a transition plan that you are supposed to follow. As part of this transition plan, you are supposed to only workout to 50% of your maximum ability for the first week following the Reset, then give it 100% thereafter. After the Reset, I started doing some Jillian Michaels workouts that were pretty easy to me before the Reset (the 30 Day Shred workouts). These workouts were shockingly more difficult that I remembered, and I even got sore from them! I was definitely out of the groove after not working out for 21 days. I started Focus T25 the 6th day after the Reset ended. These workouts also had not been all too hard for me before the Reset, but they were really challenging for me after the Reset. This was a good thing! Though, it was definitely frustrating to see how unacclimated my body had become to working out. I took is slow, definitely giving more than 50%, but not quite 100%, and in time, began pushing myself harder and harder. I’ll be starting week three of Focus T25 on Monday, and I feel like I’m back into the groove now. 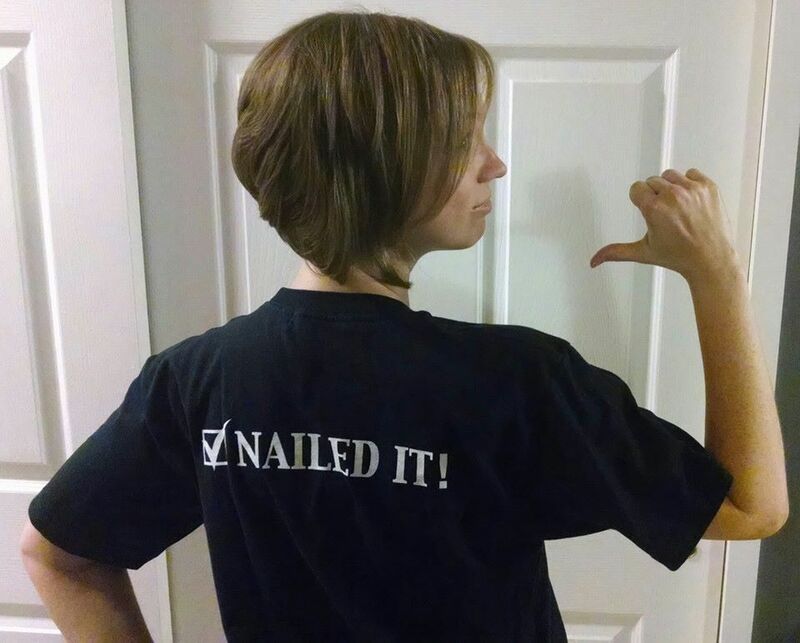 I’m “nailing” those workouts, and it feels great! I’ve been following the transition plan post-Reset. I described this in my last blog post. Basically, it’s doing the Reset in reverse minus the supplements (though I did order the Maintenance Kit, which includes Optimize and Alkalinize, which I have been taking). When you complete the Reset, you had been eating only fruits and vegetables for a week. 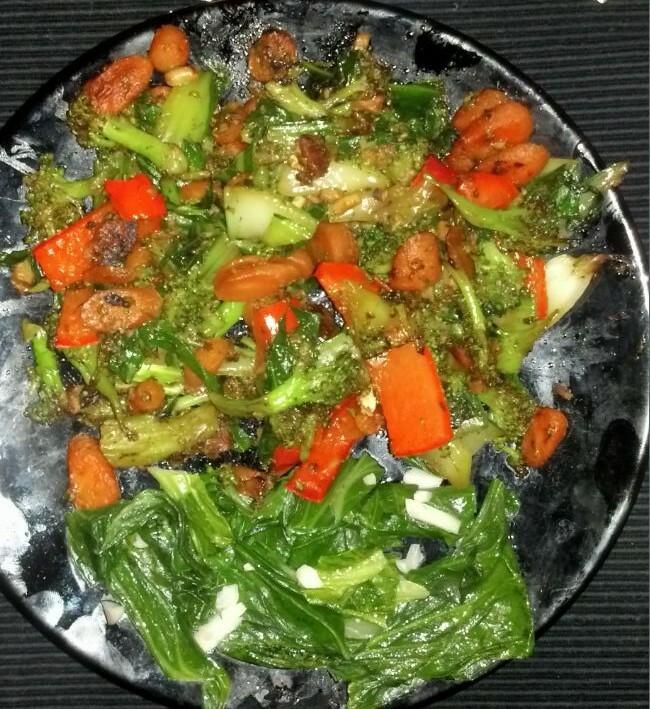 The first week after the Reset, I slowly started reintroducing grains and legumes into my diet. I stopped following the Reset Guidebook. Instead, I started having a Vegan Chocolate Shakeology for breakfast every morning. For lunch, I built a salad from my office cafeteria’s salad bar (full of good things like raw spinach, carrots, mushrooms, sunflower seeds, green peppers, onions, oil and vinegar). For dinner, I would make us a recipe from the Ultimate Reset book, or we would go out and order something that conforms to our diets. Le Pain Quotidien was actually pretty wonderful for this. 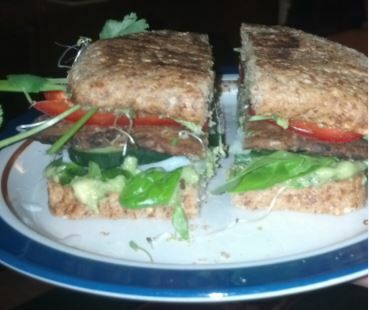 The second week, we started to add tempeh and sprouted grain breads into our diets. We also started to increase the amount of grains and beans that we consumed. Sprouted grain breads are essentially Ezekiel breads. These breads use only sprouted organic live grains, unlike the bread that we normally have, which are, I guess, dead. Ezediel bread is pretty good! I started making a sandwich of Ezekiel bread, guacamole, smokey tempeh, cucumbers, spinach, sprouts, onions, tomatoes, and red pepper. It’s pretty awesome. I really loved tempeh during the Reset, so I was very happy to finally have it back! Now, I’m 3 weeks after the Reset. According to the transition plan, you can now begin reintroducing non-Vegan Shakeology (Yes! Greenberry, I have missed you!) and some animal proteins, like eggs and yogurt. When I had my first hard-boiled egg, I had been completed VEGAN (not just vegetarian) for a full month. Next week, is when all of the fun is supposed to begin – sugar, soda, coffee, alcohol, chicken, and fish. Well… halfway through week three post-Reset, it’s my husband’s birthday. So, we’re going to start all of that week four stuff a couple of days earlier, and I have no problem with that. We’ve been really good for over a month. I know that not everyone who does the Reset really follows the transition plan afterward, so I think I’m ahead of the game right now. Yesterday, my husband and I went to (what was) the first certified-organic restaurant in the country and had dinner to celebrate his birthday. This seemed very much in the spirit of the Reset. We had fish, wine, and refined sugar a couple of days early. We had an avocado-crab appetizer, which was amazing. I had scallops and vegetable risotto for dinner, and my husband had halibut and vegetables for dinner. We split a small chocolate cake and a bottle of wine. Let me just say that alcohol really hit me. Normally, my husband and I could drink a bottle of wine easily, no problem. I was feeling the alcohol effects after the first glass! That’s crazy! Today, on his actually birthday, we had a very nice brunch. I ate completely vegetarian – an appetizer of various dips (parsley, beets, and tzatziki); a carrot-ginger soup; eggs with mushrooms, a salad, and potatoes; and split a slice of walnut cake with my husband for his birthday. Everything was amazing. I also had a couple of wonderful cocktails – one make of vodka, Greek yogurt, honey, lemon, and rosemary. Alcohol Epiphany: I’ve changed my general attitude toward alcohol as a result of the Reset. This is important. Being sober for 30+ days sucked, but it was helpful in that it made me realize that alcohol is an accessory, it’s not an entree. I’ve come to the conclusion that if I am going to waste calories on alcohol, that alcohol had better be AMAZING. I’m talking fancy hand-crafted cocktails, craft beer, and fine wine. I’m not sure I’m going to drink crappy alcohol (e.g., PBR) with the sole intention of getting drunk anymore. If I’m going to drink, it better be something decent. Meat Epiphany: I’m thinking the same way about meat as well. While I was never much of a fast-food (e.g., McDonald’s) type of person pre-Reset, it demonstrates my point. If I’m going to eat meat, I don’t think it’s going to be a McDonald’s hamburger; it’s going to be grass-fed filet mignon or kobe beef. I’m not interested in putting garbage into my body. Reactions: As you start to reintroduce new foods, you are supposed to listen to your body to ensure that you’re not experiencing any bloating, gas, skin, or sinus problems, which could indicate a sensitivity or allergy to the newly introduced food. Until recently, I haven’t really experienced anything like that. I’ve been having some minor digestive discomfort over these birthday celebrations, which could really be attributable to anything, so after this weekend, I will be sure to get back into the clean-eating groove. It’s good to note that, this morning, after drinking wine, I did not feel wrecked. I was really worried about how alcohol would affect me. So far, so good. My FREE Reset T-Shirt Arrived! The Reset is ON SALE for a couple of more days – until the end of March. Buy it here and start your journey! This is truly an amazing life-changing experience that I would recommend for anyone who thinks has it in them to do it. It is very rewarding, but it is far from easy. If you’re looking to start the Reset, I am happy to help coach you through the process. Please comment below. BMI: On day 1, my BMI was 25.2 (overweight). On day 22, my BMI was 23.7 (normal). *I weighed myself 3 days after the Reset ended, and I was down another pound. So far, total weight loss is 9.2 pounds. So, you don’t start gaining weight as soon as the Reset ends. BMI: On day 1, his BMI was 22.0 (normal). On day 22, his BMI was 20.8 (still normal). Now that the Reset is over, I am trying to follow the transition plan to reincorporate foods into my diet. This first week, the focus is bringing back grains and legumes. You are supposed to introduce grains first, see how it goes (i.e., make sure your body does not react unfavorably to the grains), then introduce legumes. I am 3 full days out of the Reset, and I’ve reintroduced 1 serving of grains, and 1 serving of legumes – with one day in between them where I only consumed fruits and vegetables. So far, I haven’t noticed any adverse bodily reactions reintroducing grains or legumes. So far, so good! The first day after the Reset, I had Vegan Chocolate Shakeology for breakfast, blended with coconut water and 1/4 of a banana. On the Reset, we could substitute distilled water in Shakeology for coconut water, which I didn’t do during the Reset. So, I’m using coconut water now before getting into “milks.” Shakeology has never tasted better! While I could have had it every day during the Reset, I really tried to limit it only to days where I needed it as a snack to make it to dinner. 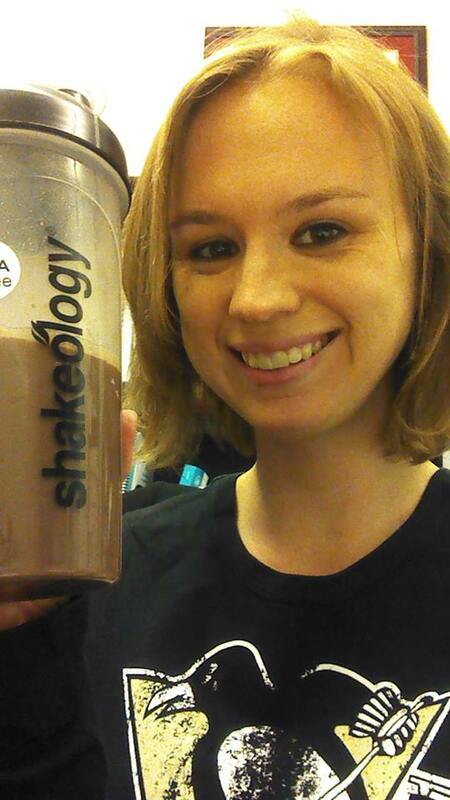 So, I’ve really missed Shakeology. I’m so happy to have it back! For lunch, I went to my office’s cafeteria. We actually have a pretty decent salad bar. I built a salad with spinach, raw carrots, mushrooms, green peppers, sunflower seeds and oil and vinegar. Finally, for dinner, we went to Le Pain Quotidien. I had never been to one of these before, and was very happy to see so many vegan options on the menu. 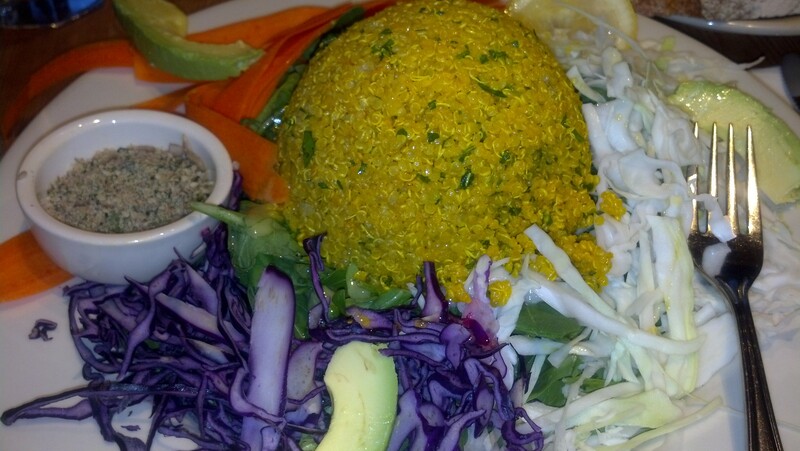 I got a “detox salad,” which had cabbage, quinoa, greens, avocado, nuts, and carrots. It was amazing! And it felt so good to have had someone else chop up all the veggies! My husband got the same thing plus an order of chia seed pudding. Since all of their sweeteners are “raw” and we could have raw sweeteners on the Reset, I assumed it would be okay for us to have a little chia seed pudding the day after the Reset. 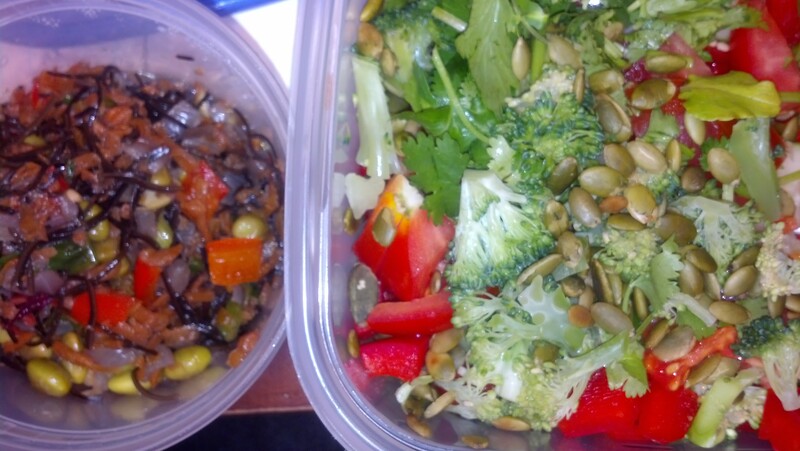 Same routine – Chocolate Vegan Shakeology for breakfast and salad bar for lunch. For dinner, we made my husband’s favorite recipe from the Reset – the roasted squash. I added a side of lemon-pepper kale. Same breakfast. For lunch, I added beans (kidney, black, and lentils) to my raw salad to reintroduce beans into my diet and see how my body would react. For dinner, we had the Reset recipe of Asian Stir Fry and more lemon-pepper kale. So far, I’m still doing the vegan thing. I’m going to try to wait to reintroduce animal proteins for 2 weeks, as Beachbody recommends. I have no intentions on staying vegan (or vegetarian) permanently, but I’m still considering my long-term options as I continue to reintroduce new foods and listen to my body. I still feel about the same as I did on the Reset. I’m still sleeping very well. My energy is still up, though week 2 was definitely the peak of my energy, and it’s been holding steady since week 3 started, though not a strong as week 2. Otherwise, feeling pretty good! No digestive issues yet either. I entered the Beachbody Challenge today! Every day, Beachbody gives away $500 in prizes, and a $100,000 grand prize! You don’t have to lose the most weight or gain the most muscle in order to win something. Plus I get a free t-shirt for completing the program. Day 21 – Revitalized! Ultimate Reset Complete! I’m breathing a huge sigh of relief right now. I made it. I completed the Beachbody Ultimate Reset! I feel great! I’ve learned a lot – more than I expected – about food, being healthy, about myself, and my own personal limits (or lack thereof). I’ve overcome a lot of obstacles. They weren’t all obstacles originating from the Reset program itself; some of them I created (like staying awake in a movie theater for 24 hours) and some nature created for me (the death of a dear family member). Either way, I’ve learned how to really use food as fuel for my body – not as a crutch, or a convenience, or an addiction, or a social expectation. I’ve improved my digestion DRASTICALLY. I mean, without getting into the nasty little details, my digestion is 500% better than it was before the Reset. I’ve increased my energy and mental clarity significantly. And I’ve lost some weight in the process. While my success on the Reset is not measured in how much weight I lose, it is nice to know that it’s happening, and that I reached my goal of meeting a “normal” healthy BMI, which I haven’t been at in years. I’m very proud of myself and what I’ve accomplished in the past 21 days. I took my last Alkalinize today, and rather than looking at it as steamed liquid spinach in a glass, I looked at with a sense of nostalgia. I’m looking forward to sharing my experiences with others and answering questions about not only the Reset but also how to live a cleaner and healthier life in general. Please feel free to contact me with any questions! So what was in day 21? You guessed it – fruit for breakfast! Lunch was an awesome carrot-seaweed medley, which included a new seaweed – arame, which kind of resembles a very thin black pasta. This medley was delicious, and something I’ll definitely prepare post-Reset. And what would the last day of the Reset be without the microgreens salad? Of course, that made an appearance too. My evening was busy. I had my first acupuncture appointment ever today. It was very relaxing – it felt like a massage for my soul! Then, I had a meeting into the evening, so my husband graciously prepared dinner. I am so proud of him! During the Reset, he LEARNED TO COOK! Nothing beats that. 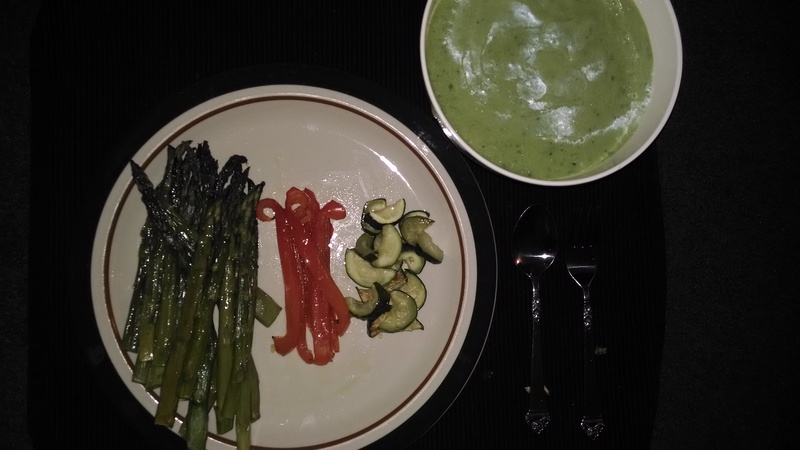 He could hardly cook Ramen Noodles before the Reset, and now he’s preparing avocado-cucumber soup and roasted veggies – all of which came out perfectly! Dinner was so filling, I actually couldn’t finish it. The avocado-cucumber soup was delicious and little spicy (I love spicy) with jalapeno and cilantro. Amazing way to end the Reset! Now, there are a bunch of empty bottles of pills in my recycling bin. It’s really sad to see all of the little guys go. So sad that I actually ordered a Maintenance Kit that includes the Optimize and Alkalinize supplements. I’m also going to sign up for the Alkalinize supplement on home direct because I think it’s really going to help me as I begin to reintegrate acidic things back into my diet (like alcohol). While my official Reset may be complete, that doesn’t mean I can jump right back into red meat and rum tomorrow. Oh no. I think my intestines would explode if I tried that. There is a whole transition process, where you slowly reintroduce things back into your life. For example, I can start reintroducing grains tomorrow, then legumes if I do well with the grains; then, next week, I can reintroduce tempeh and sprouted grain breads; the following week is animal proteins, beginning with yogurt or eggs; and finally, 4 weeks after today comes sugar/soda (yuck), coffee (starting 1/2 decaf), alcohol (go light at first), and chicken and fish. At each step of the process, you are supposed to listen to your body and watch out for discomforts like bloating, gas, skin and sinus problems, which may indicate a sensitivity, or perhaps even an allergy, to a certain food group. I’m really curious to see how my body reacts as I reintroduce things, and hope that I can get to the bottom of whatever food (or drink) group might have been holding me back pre-Reset. As far as consumption goes post-Reset, I think I am going to immediately restart my morning Shakeology for breakfast. My body is perfectly primed right now to accept all of the nutrients that come in this amazing shake. For lunch, I’m going to go for the cafeteria’s salad bar at work, which has a lot of healthy options. I think for dinner I’m going to try to prepare some of my favorite meals from the Reset. In the short term, I’m going to try to stick to the transition plan. I’m going to try to reintroduce everything, though I have toyed with the idea of being a vegan or vegetarian. I think a lot of that will be decided in the future, as I listen to my body for sensitivities and try to weed out those foods that might not work for me anymore. It could be chicken. Who knows? I certainly don’t know what those foods might be, but I’m certainly open to anything. I know I’m going to drink less coffee than I did in the past. I don’t really feel like I need it anymore now that I’ve become able to tune into my body’s natural energy. I think I might cut back on alcohol, though I am definitely not going to have a dry household. I do love fancy cocktails. I am super excited to begin working out again! I think my body is going to be really receptive to exercise right now. It is recommended that you only workout at about 50% your max for 1 week before giving it 100%. I’m going to start working out to some old Jillian Michaels videos tomorrow (they were pretty easy to me before the Reset). Then, on Monday, I’m going to start Focus T25. My goal is to complete the whole program (it will be my second time completing it in full), then do Insanity again (it will be my fourth time completing it in full), and then finally do Insanity the Asylum (it will be my second time completing it in full). Les Mills Combat is also on sale this month, and I’m going to buy it, but I’m not sure where I’m going to fit that into my schedule. I like the idea of the Shaun T progression. For each program that I complete (including the Ultimate Reset! ), I am going to send in before and after pictures to Beachbody as part of the Beachbody Challenge, get a free t-shirt, and enter to win cash prizes! Should be a pretty cool progression from Reset to Asylum. Wish me luck! Let me know if you want in on this opportunity. Keeping you all informed of my progress as I begin reintroducing foods. Getting back into non-Vegan Shakeology. I really miss my Greenberry shakes! Digging into my NatureBox and BuluBox, which are sitting untouched. Enjoying booze (in a couple of weeks). Getting out again and dining out in my city! No more cabin fever cooking meals endlessly at home! My Team Beachbody Coach Page – Let me coach you through the Ultimate Reset or any other Beachbody program. Where to Buy the Ultimate Reset – You can buy this on sale right now – March 2014! Up to $85 off if you purchase it with Shakeology! Time to get ready for summer! Only 1 more day left of the Beachbody Ultimate Reset! I can’t believe that I am so close to the end of this amazing journey. Day 20 started as it has every day this week – with the fruit plate of berries, apples, and melon. When I first started week 3, I was skeptical of the ability of fruit to hold me over until lunch. But much to my surprise, it’s doing the trick! I’m definitely hungry by the time lunch time rolls around, but the fruit breakfasts seem to be satisfying me just enough to make it. Lunch was a jicama-avocado salad. The microgreens salad that you eat a bazillion during the Reset is supposed to have jicama in it. But, since I can’t find jicama at every grocery store, I’ve been substituting it with other vegetables in the microgreens salad. I’ve gotten into the habit of just not buying jicama. 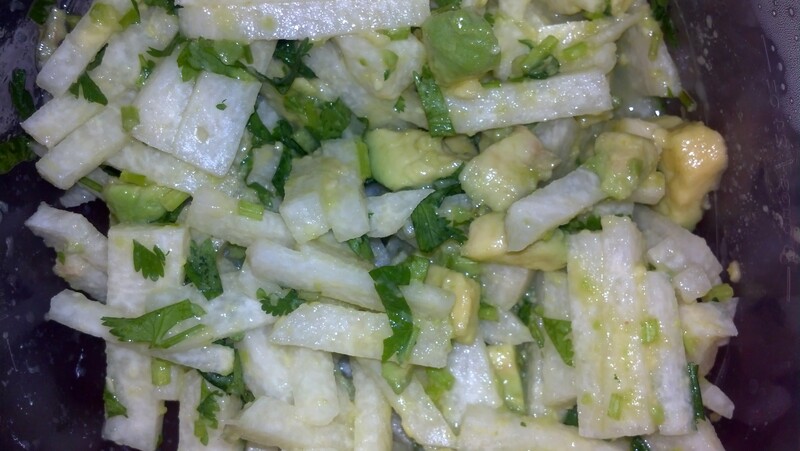 So, this jicama-avocado salad was actually my first introduction to jicama. I think I’ve had jicama before, but I’ve never bought it and prepared it myself. Jicama looks kind of like a cross between a potato and turnip, and it tastes a little sweet – like a cross between pear and potato. It’s not the most cooperative vegetable(…?) to cut. I thought the salad was nice and refreshing, and I loved the cilantro in it. I’ve rarely taken advantage of the snack option during the Reset. I think I’ve snacked (on official Beachbody snacks, mind you – not Doritos!) maybe 4 of the 20 days total. You can have a snack between lunch and dinner, but you only should if you don’t think you can make it to dinner. Well, tonight, I had tickets to a hockey game, so I had a half serving of Chocolate Vegan Shakeology (one of two Shakeology flavors that you’re permitted to have during the Reset) shaken with some distilled water (nothing fancy) before heading out to the game, knowing that I would not be eating dinner until after the game. Shakeology did the trick. It kept me full until around dinner time. My husband made tonight’s dinner! What a treat! Dinner included two new recipes – Asian stir fry and a 1/2 serving of braised greens. Unfortunately, I forgot that the reason I had two bunches of collard greens in the refrigerator was because I was reserving one of the bunches for the braised greens. Since I had done a double serving of collards yesterday, all we had left to use was bok choy, which didn’t really create that much braised greens. They were delicious nevertheless, and I was quite full after eating the huge serving of Asian stir fry, which was so good with the coconut oil! Well, tomorrow is it! The grand finale. I have no idea what I’m going to do with myself post-Reset. Better come up with a plan fast. We’re counting down the days until we’re done with the Beachbody Ultimate Reset! I forgot to mention that at the funeral that I went to on day 17, I had a couple of people who had I not seen in 4 months remark about how much thinner I looked. One person actually did not recognize me at first. Curious about how that was possible, since I had only lost 4 lbs. thus far on the Reset, I decided to weigh myself in the middle of phase 3. Well, turns out that since day 1, I had lost 7 lbs! So, the weight is starting to shred off, which is awesome! On day 19, we spent a lot of time prepping meals for the final 2 days because our evenings over the next 2 days are jam-packed. The meals for day 19 included the usual fruit plate for breakfast. I swapped out the lunch for day 19 for the lunch from day 18 because I had all of the groceries already for day 18’s lunch (day 19’s lunch would have meant a grocery trip). Since I didn’t get to enjoy day 18’s lunch yesterday, it worked out well. Lunch included a spinach salad of avocado, cucumbers, and tomatoes. The salad was also supposed to include jicama; however, I have gotten into the habit of not buying jicama. I have not been using it in the microgreens salads because I can only get them at one grocery store – the less convenient one. So, no jicama today. I also had a baked sweet potato for lunch. Baked sweet potato = heaven. This lunch was pretty huge. No pictures, sorry, I devoured this one pretty quick. I stuck to day 19’s dinner, which was one of my favorites – baked tempeh! Tempeh, it’s been too long. Haven’t seen you in awhile. But the tempeh was only a HALF serving, which means I have extra tempeh, which I would like to eat post-Reset. However, the transition plan post-Reset says to reintroduce tempeh 2 weeks after the Reset, which confuses me because I am eating it on day 19. Hmm…I’m waiting for an answer on when I can eat the extra tempeh from the Beachbody community. 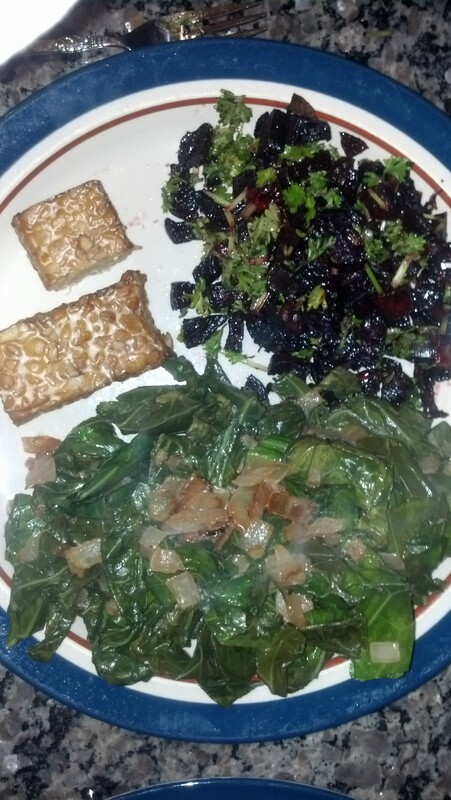 Dinner also included the Mediterranean roasted beets and a half of a serving of coconut collard greens. Unfortunately, I did not have enough beets for a full serving (it ended up being more like half of a serving), so I ended up doing a full serving of collards instead. Well, day 18 required some creativity. We had some family in town to visit DC for the first time, so we joined them for some sightseeing. While I was able to enjoy my Beachbody Ultimate Reset breakfast (another fresh fruit plate), I had to deviate from the prescribed Reset recipes for lunch and dinner. We were going into a number of Smithsonian museums, and most of the museums do not let you bring in water or food. So, we were without our distilled water and food. Also, at the risk of security confiscating my Himalayan pink salt (or worse, detaining me on suspicion that the powder was something else), I opted to keep the salt at home. We survived. After having my Mineralize, Optimize, and Revitalize supplements at home, I took a nice long walk on a beautiful day and joined the group at the National Museum of the American Indian’s Mitsitam Cafe. For those of you unfamiliar with DC, the National Mall is where many of the standard touristy activities are. The vast majority of dining options on the National Mall are garbage – hot dogs, pretzels, chicken strips, french fries, McDonald’s, and other processed wonders that your typical American tourists wouldn’t hesitate to stuff shamelessly into their faces. The Mitsitam Cafe is a glorious exception to the artery-clogging wasteland of museum cafeterias. It features American Indian cuisine among various regions, and it is one of the healthy alternatives on the National Mall. Normally, I would have no problem eating healthy at the Mitsitam Cafe – there are lots of vegetables and healthy grains, like quinoa, fresh salmon, and other things to choose from. However, this final week of the Reset is so strict that it was hard to find something to eat there. A lot of the vegan dishes had grains or were prepared with a vinaigrette (which, to me, equates to sugar). The only thing I could find that met the criteria was a side dish of grilled zucchini and stewed tomatoes – no butter or sugar or vinaigrette. So, my husband and I enjoyed two side orders of the zucchini and tomatoes, and split a side salad of greens, carrots, cucumber, and tomatoes (no dressing), and a mixed berry fruit cup. Success! Our afternoon Alkalinize supplement wasn’t easy either. Since we can’t bring our own water into the museums, and there was no distilled water in a 1-mile radius, we settled for gift shop Polar Springs bottled water. I know, I know, it’s no distilled. I’m hoping that one 16-ounce serving of nondistilled water won’t do any harm. Considering that I was also very thirsty, I’d rather have some water to hydrate myself than no water at all. For dinner, we made reservations at a local spot that we knew had great salads that would be Reset-friendly. As an appetizer, we split an baked eggplant stuffed with tomatoes, garlic, onions, and green peppers. For our main course, we each had a mixed salad of Romaine lettuce, onions, tomatoes, cucumbers, and carrots with oil and vinegar dressing on the side. 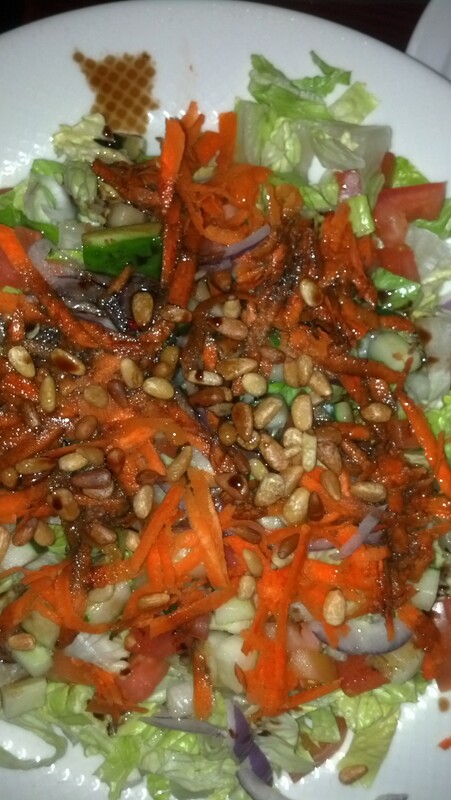 Seeing that some of their other salads had toasted pine nuts, and knowing we can eat toasted pumpkin seeds, I asked for them to add the pine nuts to the salad for a little protein. It was delicious! With all of the family leaving tomorrow, it’s back to the Reset recipe book for the final 3 days! While it has felt nice to sit down in a restaurant again and be served for a change, I’m looking forward to preparing our own meals so we know we’re getting the right food and portions. We’ve both been a bit more tired than usual in this final week, and I suspect part of that has to do with the compromises that we’ve had to make to our diet (I really think our portions out at restaurants haven’t been as big as we are allowed to have on the Reset). Also, we may be more tired due to the emotional and mental exhaustion associated with the funeral service and all of the family in town. And now, onto the final “challenge” of my Beachbody Ultimate Reset. At the beginning of this process, I identified a number of situations that I would be in during the 21 days of the Reset that would be particularly challenging. Today, I completed the final one – the Reset during mourning and a funeral service. The morning started as planned – with a fresh fruit plate for breakfast. Then, the family embarked on a very beautiful, sad, and difficult funeral service for a very close family member. While pre-Reset, we most certainly would have comforted ourselves in this situation with alcohol and a heavy meal, we resisted pretty well. After the service, we attended a late lunch/early dinner at a wonderful restaurant that had our whole party seated in a private mezzanine, with a slideshow to honor the deceased, an open bar, trays of appetizers (the largest shrimp I’ve ever seen, frankfurters with sauerkraut, crab cake sliders, cheese, bread), and trays of desserts (milkshake shooters, miniature flourless chocolate cakes, fruit tarts, and cream puffs). Wow, did everything look amazing! My husband and I didn’t touch a thing. We ordered a market greens salad, hold the chicken, no dressing, with oil and vinegar on the side. I had this salad in lieu of the day 17 lunch included in the Reset book (i.e., Moroccan carrot salad, 3 cups of greens, and dressing). The salad was absolutely wonderful and absolutely Reset-friendly, though a little small; I think I would have gotten to eat more food on the Reset lunch. Anyway, the salad came with local greens, carrots, fennel, radish, and herbs (dill, I think). It was very hard to say “no” to all of the booze flowingly freely and amazing food floating around, which all smelled wonderful, but I kept reminding myself that I don’t HAVE TO have any of it, the only person who can break the Reset for myself is ME, no one is going to shove a milkshake shooter down my throat, so I stuck to it. I can always go back to the restaurant some other day. It’s just across the river. Whew, what a challenge! In general, during sad times, I find it best to avoid alcohol. Keep it as a celebratory enhancer. In times of sadness, alcohol has a way of either numbing your emotions so that you cannot properly deal with them, thus hindering you from fully grieving, or it amplifies your emotions so that they run wild and out of control. I think it’s best, based on the Reset and past experience, to just experience the pain and grief fully. It makes you stronger and helps with the healing process. Back to the food – the salad was nice, but we were definitely hungry when dinner time rolled around (the others who indulged at the restaurant were not). 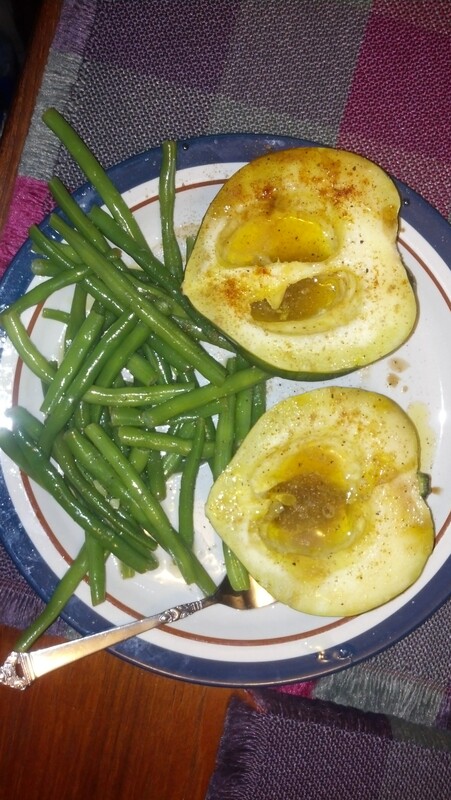 I cooked dinner for my husband and me – roasted acorn squash with green beans and lemon. While the Reset recipe book calls for delicata squash, the only squash that my grocery store had were acorn and butternut, and the recipe book says that you can substitute any squash, so I went with acorn. This was actually my husband’s favorite meal that he has had on the Reset! The acorn squash was baked in the oven and then topped with lemon juice, olive oil, and Bragg’s Liquid Aminos. I had some other curry spices to add some more flavor (pink salt, black pepper, cumin, red cayenne, and coriander). Tomorrow is going to be hard. We are going to be doing some sightseeing with some relatives who are here in DC for the first time. I will be skipping both of the Reset meals planned for tomorrow (lunch and dinner), and instead searching for healthy choices. Dinner should be fine – we have reservations somewhere I know can give us a great salad. Lunch, well, that might be Challenge #6. Tomorrow is going to be a very difficult day. Today, we have a bunch of family coming in to town to attend a funeral. Luckily, we are on home turf throughout, and we have plans to stick to the Beachbody Ultimate Reset. I stuck to the Reset diet plan today. Breakfast was a fruit plate for breakfast, and lunch was my good old friend the microgreens salad and only the microgreens salad. No soup or anything to go with it. For dinner, I cooked for three! We hosted dinner at our place. My parents visited, and my husband’s mother. I made an extra Reset meal for my mother, who has a pretty healthy diet in general and doesn’t mind overindulging in veggies. The other two ordered delivery Chinese. 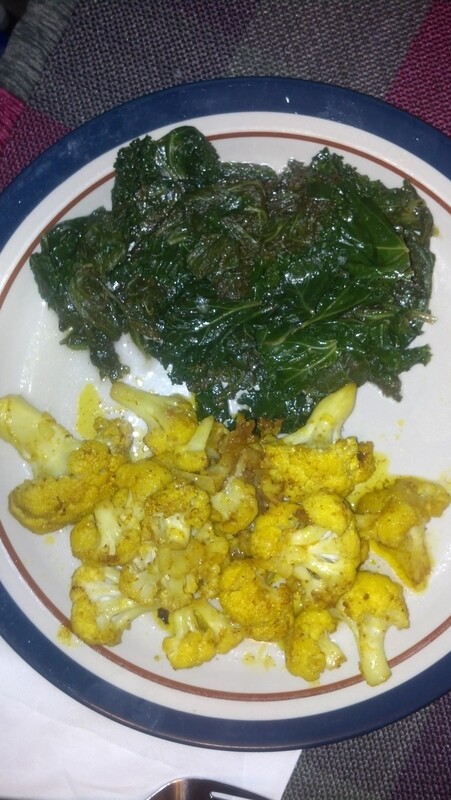 The Reset dinner included curried cauliflower and lemon-pepper kale. The cauliflower recipes calls for “curry powder,” but rather than go out and buy curry powder, which is really just a combination of other spices, I made my own – cumin, coriander, tumeric, salt, black pepper, and red cayenne pepper. The cauliflower turned out excellent! I am actually one of the weirdos of the world who loves cauliflower, so I really enjoyed this recipe baked in the oven with olive oil. The lemon-pepper kale was not entirely kale. We accidentally bought mustard greens at the grocery store a couple of days ago. None of the Reset recipes call for mustard greens, but kale is pretty similar, so we had half kale and half mustard greens. I’m not sure if you can really tell the difference in the picture, but the kale is the brightly colored green vegetable, and the mustard greens are a little gray. I’ve come to realization recently (and I came to this realization pre-Reset) that I don’t really care for Chinese food. I’ve never been to China, and can’t comment on authentic Chinese food. But, what we get here in America at least isn’t really worth the calories to me. I love Thai, Japanese (sushi! ), Korean, Vietnamese, Indian – every other type of food the great continent of Asia offers, as Americanized as it may be, except Chinese. Something about baby corn and water chestnuts. Anyway, the Chinese food ordered included Hunan beef, fried chicken wings (Chinese? ), and a Pu-Pu Platter, which included deep-fried wonders like crab rangoon, shrimp toast, fried chicken, ribs, and other questionable items. I can’t say I was particularly jealous of the Chinese food meal the others were eating. I was pretty happy with my cauliflower and kale, thanks!